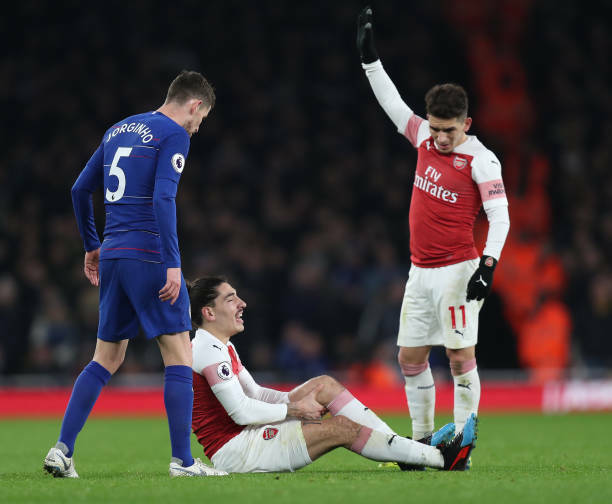 There are rumours that say that Hector Bellerin could be ruled out for nine months because of the injury which he sustained in the Chelsea match. The gunners faced Chelsea yesterday at the Emirates Stadium and they got all the three points but their happiness was cut short after Hector Bellerin appeared to have sustained an injury that will probably keep him out for many months. Arsenal head coach Unai Emery was delighted that he had welcomed Hector Bellerin back into the squad after having been on the sidelines for weeks. The Spanish right back played for a few minutes in Arsenal’s match against West Ham United and was this time selected in the starting eleven that played the Chelsea match. Hector Bellerin had an impressive performance against Chelsea because he even assisted Alexandre Lacazette’s goal in the first half but he however got injured in the second half and was strenched off the pitch leaving many Arsenal supporters in fear of how long he will be out. Arsenal head coach Unai Emery faced the press after the match and he said that the injury of Hector Bellerin doesn’t look good but he however reassured the fans that they have many people who can play in the right back position. “We have Ainsley. He is playing with good pieces, today also he played well I think. He can help us by playing like a right back or a right winger.” Unai Emery told Arsenal Media.